What is Bargaining Power of Suppliers? The Bargaining Power of Suppliers, one of the forces in Porter’s Five Forces Industry Analysis Framework, is the mirror image of the bargaining power of buyers and refers to the pressure suppliers can put on companies by raising their prices, lowering their quality, or reducing the availability of their products. This framework is a standard part of business strategyStrategyCorporate and business strategy guides. Read all CFI articles and resources on business and corporate strategy, important concepts for financial analysts to incorporate in their financial modeling and analysis. First mover advantage, Porter's 5 Forces, SWOT, competitive advantage, bargaining power of suppliers. The bargaining power of the supplier in an industry affects the competitive environmentBarriers to EntryBarriers to Entry are the obstacles or hindrances that make it difficult to enter a given market. These may include technology challenges, government, capital costs, switching costs, etc.A primary barrier to entry is the cost that constitutes an economic barrier to entry on its own. An ancillary barrier to entry refers and profit potentialNet Profit MarginNet profit margin is a formula used to calculate the percentage of profit a company produces from its total revenue. The profit margin ratio of each company differs by industry. Profit margin = Net income ⁄ Total revenue x 100. Net income is calculated by deducting all company expenses from its total revenue which is of the buyers. The buyers are the companies and the suppliers are those who supply the companies. The bargaining power of suppliers is one of the forces that shape the competitive landscape of an industry and helps determine the attractiveness of an industry. 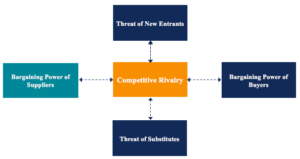 The other forces include competitive rivalry, bargaining power of buyers, the threat of substitutes, and the threat of new entrantsThreat of New EntrantsThe Threat of New Entrants refers to the threat that new competitors pose to current players within an industry. It is one of the forces that shape the competitive landscape of an industry and helps determine its attractiveness. Other forces are competitive rivalry, bargaining power of buyers, threat of substitutes,. Manufacturers and Vendors: Sells products to distributors, wholesalers, and retailers. Distributors and Wholesalers: Purchases goods in medium/high quantity for sale to retailers or local distributors. Independent Suppliers / Independent Craftspeople: Sells unique products directly to retailers or agents. Importers and Exporters: Purchase products from manufacturers in one country and exportBalance of PaymentsThe Balance of Payments is a statement that contains the transactions made by residents of a particular country with the rest of the world for a specific time period. It is also known as the balance of international payments and if often abbreviated as BOP. It summarizes all payments and receipts by to a distributor in a different country. Drop shippers: Suppliers of products for different kinds of companies. When is Bargaining Power of Suppliers High/Strong? When is Bargaining Power of Suppliers is Low/Weak? When doing an analysis of supplier power in an industry, low supplier power creates a more attractive industry and increases profit potential as buyers are not constrained by suppliers. High supplier power creates a less attractive industry and decreases profit potential as buyers rely more heavily on suppliers. The number of suppliers relative to buyers: There are a significant amount of suppliers relative to buyers (companies). Therefore, supplier power is low. Dependence of a supplier’s sale on a particular buyer: If we assume that suppliers have few customers (i.e. a small/medium-sized firm), they are likely to give into the demands of buyers. On the other hand, if we assume suppliers have several customers, they have more power over buyers. Since we do not know whether these suppliers have few or many buyers, a middle ground would be a reasonable answer. Therefore, supplier power is medium. Switching costs: Since there are a significant amount of suppliers in the fast food industry, switching costs are low for buyers. Supplier power is low. Forward Integration: There is low forward integration in the fast food industry. Overall, McDonald’s faces low bargaining power of suppliers. Therefore, supplier power is not an issue for McDonald’s in the fast food industry. However, bargaining power of suppliers alone does not determine the overall attractiveness of an industry. The remaining forces (bargaining power of buyers, rivalry among existing competitors, the threat of new entrantsThreat of New EntrantsThe Threat of New Entrants refers to the threat that new competitors pose to current players within an industry. It is one of the forces that shape the competitive landscape of an industry and helps determine its attractiveness. Other forces are competitive rivalry, bargaining power of buyers, threat of substitutes,, and the threat of substitutes) must be taken into consideration when determining overall industry attractiveness. Thank you for reading this guide on the bargaining power of suppliers. CFI is the official provider of the FMVA Financial Analyst DesignationFMVA™ CertificationThe Financial Modeling & Valueation Analyst (FMVA)™ accreditation is a global standard for financial analysts that covers finance, accounting, financial modeling, valuation, budgeting, forecasting, presentations, and strategy. , using financial modeling courses to turn anyone into a great financial analyst.